We decided to organize this Hokuriku chapter to gather APU alumni people who are from Hokuriku and/or living in Hokuriku now. For the first step, we will have an opening reception and party in Fukui. 5 members of Horiku chapter committee (including international students) , APU vice president and APU alumni chairperson (or vice chairperson) will be attending. Also, we will have a special guest (Especially for 1st-4th generation). We are looking forward to seeing a lot of alumnus. Please check the following information down below. 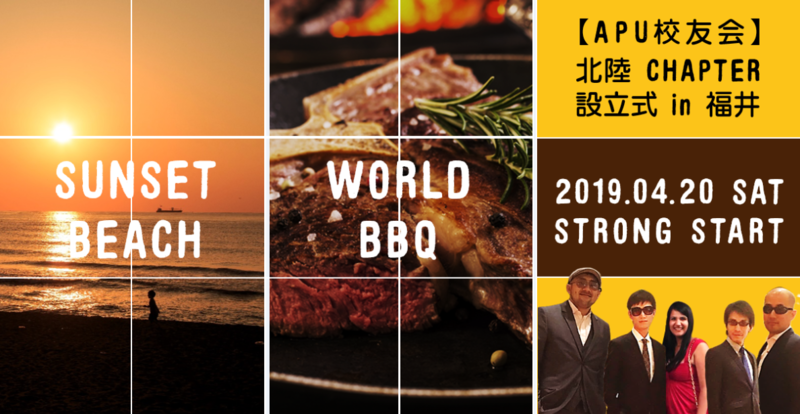 APU alumni association Hokuriku chapter & World BBQ STRONG START! →We will pick you up at the station. We will tell you more details after filling out the application. Fee: We will be sharing expenses. APU alumni association will support budget, it won’t be too much. Please pay transportation and hotel by yourself. This is the opening ceremony. We will invite guests from APU. We will drink SAKE from Hokuriku, introduce our members and discuss future plans. World BBQ is a reunion BBQ where APU alumni can get together from all over the world and we want to make a challenge with the style of BBQ, so we will have Argentina BBQ. We will roast a big piece of beef Argentenian style and enjoy it together. Our first theme is ”STRONG START,” to encourage our alumni chapter to start something new together. *You don’t need to attend both programs. *We will be happy to see your family too. Deadline is listed on the dates below. In order to prepare the ceremony and BBQ, we will decide the number of participants after 1st registration, so please apply as soon as possible if you are interested. ▽Please check our Facebook page!